In Rome on holiday, Professor John Curtis and his daughter, Janet, sign in at a local pension. As Janet gets out of the elevator at her floor, her father takes the elevator to his room, number 47. Two men, including the hotel's desk manager, Vittorio Gasperi, drug him with ether. Later, a hospital ambulance is seen driving off as Janet, seeking her father, finds that someone else occupies that room which had been assigned to her father. Returning to the check-in desk, Janet is told by Vittorio that he only recalls checking her in and that he knows nothing of anyone else having been with her. Given the pension registry, Janet finds to her amazement that only her signature appears. 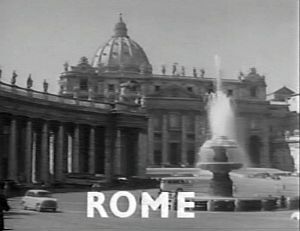 After reporting the incident to the police, Janet then finds Detective Charlie Chan who is also visiting Rome currently. Telling him her story, Chan notes that her father is currently working on a secret project on untrasonics for the government. Chan agrees to help, suggesting that they exchange hotel rooms. Later, meeting Janet at the pension, Chan takes possession of her key, sending her off to his hotel. As the desk clerk protests, Chan signs the guest book stating he will be staying in Janet's room which she has given to him. As he signs, Chan notes to the clerk that a page has been removed, which is illegal. Informing him that he is Inspector Charlie Chan, the clerk, knowing of his renowned stature as a detective, becomes very nervous, denying any knowledge of any wrongdoing. Threatening to telephone his friend, Inspector Galvani of the Rome Police, the clerk reveals the current whereabouts of Victor Gasperi. On arrival at Gasperi's apartment, Chan is informed by Vittorio's wife, a Polish national named Roxannel, that he is not at home. Introducing himself and explaining how her husband may be involved in the kidnapping of a noted scientist, Mrs. Gasperi suddenly understands the seriousness of the situation. Looking about the apartment, Chan notes the presence of several expensive items, inferring that is unusual forsuch high-priced items would be seen in such a modest apartment. Roxanne pleading with Chan, asking that her husband be spared, agrees to give the detective some information. At that moment, Vittorio arrives, threatening Chan and then attacking him. Overcoming his attacker and rendering him out cold, Chan agrees to leave and meet with later with Mrs. Gasperi at the Forum near Rome's Colosseum where she will give him more information. 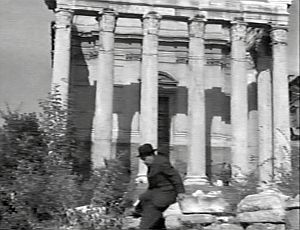 Later, playing the part of a tourist amid the ruins of the Roman Forum, Chan is followed by a man, a fact that is not unnoticed by the detective. Chan seeks the opportunity and quickly eliminates this threat, rendering him unconscious. Then, continuing on, Chan soon comes across the lifeless body of Roxanne, on whose person he finds the knife that killed her and a scrap of paper containing a telephone number. The following day at police headquarters, Chan learns from Inspector Galvani that his attacker's name is Guido Cacco and that he was paid by a tall man with a light-colored beard to beat up Chan as he visited the Forum. Also, Vittorio Gasperi has an airtight alibi as he was seen working at the pension at the time of his wife's murder. Chan surmises that Mrs. Gasperi had foolishly told her husband of her plans to meet with Chan. Vittorio than told someone else of these plans which resulted in her murder. When the Inspector suggests that Professor Curtis is probably dead already, Chan insists that Curtis' knowledge of his field is far too valuable and that he will probably soon be taken away to a foreign, perhaps Iron Curtain, power. A tracing of the telephone number found on Roxanne’s body connects it with a hospital for the insane in Rome. Quickly driving to the hospital, Chan and Inspector Galvani question the reception nurse. Showing her a photograph of Professor Curtis, she recognizes him as an English patient named John Robertson who was in the care of a Dr. Paccelli and who had been delivered in an ambulance. Although she had never seen Paccelli before, he had arranged in advance for the patient to stay at the expensive hospital. She then describes Paccelli as a tall, quiet man with a blond beard. When asked to take them to Mr. Robertson, the nurse informs Chan and Galvani that he is dead. A check of the local mortuaries and funeral parlors turns up nothing. Looking at paperwork in the Inspector's office, Chan notes that Vittorio Gasperi has spared no expense in the funeral home chosen for his wife's body, which leads the detective to speculate further on the possible location of the body of "Mr. Robertson." Back at the pension, Chan and Inspector Galvani order Vittorio to reenact, along with Janet Curtis, the events following the arrival of the Professor and his daughter earlier the day before. Suddenly, while they are at the elevator, Janet recalls how a tall, distinguished gentleman with a blond beard had entered as she exited the lift to head for her room. Vittorio then identifies the man as a Mr. Gastelli whom he claims was staying in room 47, the same room that Janet had seen her father assigned at the desk. Upon an inspection of room 47, Chan finds a paper tablet containing a note indicating a flight for John Robinson departing at 11:30 that morning. 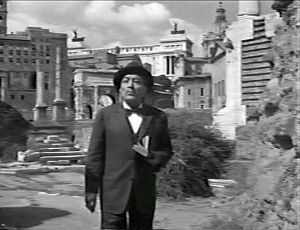 When Chan asks Vittorio if he realizes that Dr. Paccelli is responsible for his wife's murder, he protests, informing him that the doctor has arranged for a lavish funeral procession that will take her body to the Rome airport where her body will be flown to her native Poland. Upon hearing this information, Chan and Galvani make a quick trip to the funeral parlor with Vittorio. Arriving at the funeral parlor, Chan, Galvani, and Vittorio see that his wife's casket is already being removed earlier than scheduled. The Inspector demands that it be opened, and when that is done, all are stunned to find the body of Professor Curtis inside. Quickly checking the body, Chan finds that the professor is not dead, but that he has been heavily drugged. Chan asks that he be taken immediately to a hospital. Suddenly, a tall man with a blond beard enters, holding everyone at gunpoint. It is Dr. Paccelli, and he orders that the coffin be resealed, an enraged Vittorio lunges toward him. As Paccelli shoots Vittorio, Chan fires a shot that disarms him. Later, Chan describes the plot to Professor Curtis and Janet, revealing how Paccelli and others has come up with the scheme of kidnapping him and then smuggling him to Poland, behind the Iron Curtain, where he would be forced to reveal the details of his secret work involving ultrasound. St. Peter's Basilica – Located within Vatican City, St. Peter's Basilica is one of the largest Christian churches in the world. A basilica has existed at the present site for centuries on what is the long-purported site of the burial of St. Peter, one of the twelve apostles of Jesus. The original basilica was built on this site by Emperor Constantine the Great between the years 319 and 333. By the end of the fifteenth century, the Basilica was in bad repair, and in 1505, Pope Julius made the decision to demolish the old basilica and replace it with a monumental structure. For more than a century, spanning the reigns of numerous popes as well as the efforts of many architects and artists, including Michelangelo who designed the distinctive dome. The Roman Forum (Forum Romanum) – The Roman Forum is located in a small valley between the Palatine and Capitaline Hills. It is a rectangular plaza, of forum, that was originally surrounded by important ancient Roman government buildings and temples. The oldest ruins of the Forum date from the eighth century BC. Originally this area was a marketplace that was known as the Forum Magnum or simply, the Forum. For centuries the Forum was the center of Raman life and commerce. 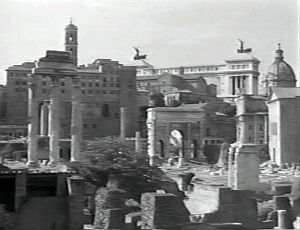 Today, the Forum is a major tourist destination in the city of Rome. Temple of Antoninus and Faustina – Construction of this temple in the Roman Forum was begun in the year 141 under the Emperor Antoninus Pius and was originally dedicated his wife, Faustina, who was deified after her death. Following the death and deification of Antoninus in 161, the temple was rededicated jointly to Antoninus and Faustina. The temple was later converted to a Roman Catholic church perhaps as early as the seventh century and named San Lorenzo in Miranda. Janet Curtis (to Charlie Chan): "Daddy told me what a wonderful detective you were and how you helped him once before." Charlie Chan (to Pension desk Clerk): "…and you may call me Inspector Chan." Pension Desk Clerk (to Charlie Chan): "Inspector Charlie Chan?" Taxicabs in Rome are more numerous than bees in hive. Old saying: "Fair exchange, no robbery." In my country, old saying: "Bigger the oath, greater the lie." When you are hunting tiger it is not wise to bring down any jackal, because this might warn larger beast to seek safety in the jungle.